Nowadays, it is a trend amongst adults to ‘Google’ every ingredient of what they eat, particularly for processed and packaged foods. But little do they know that the packaged foods do not list all their ingredients. Moreover, most processed foods do not contain essential nutrients that are a must for our daily food intake. One such component, often missing for our regular food is Fibre. Apart from aiding digestion, it plays a vital role in supporting the most crucial organs of one’s body such as a heart, blood and gut. Fibre is a form of carbohydrate, and when dieticians suggest cutting off carbs, many of us strike off fibre as well. However, dietary fibre does not affect the body in the same way regular carbohydrates do. For certain diets, it is often clearly mentioned that one must deduct the amount of fibre when calculating the carbohydrate content in foods, often using the term ‘net carbohydrates’ to denote the carb content after subtracting the amount of fibre. Here are a few healthier ways in which you can add fibre to your daily food without adding unwanted calories. Whole grains are a natural source of dietary fibre. They do not affect your body the same way as refined carbs. You can add foods such as Whole Wheat, Oats, Brown Rice, Millet, Bulgur, Rye and Barley in your diet to make it fibre rich. It will help you to be healthy and maintain the benefits of fibre without resorting to damaging high carb foods. Most fresh fruits have natural fibre in them. Therefore, all nutritionists and dieticians recommend adding fresh fruits to every meal. It will give you a balanced diet and keep you feeling full longer. You can add fruits such as apples, berries, prunes, pears, oranges and other seasonal fruits to your diet. It is recommended to consume legumes at least twice a week to have a protein and fibre rich diet that keeps your muscles and gut healthy. 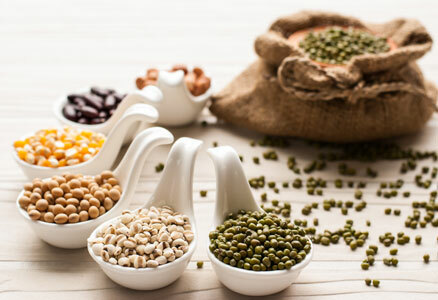 Legumes such as beans, peas and lentils are widely available and you can even try exotic cuisines from around the world using delicious Mexican, Thai or Continental recipes at home while still consuming the necessary amount of fibre. The idea of going on a diet might be a turn off for a few as they have to wave goodbye to their favourite sweets. But this is not the case, as you can cook fibre rich cookies and cakes made of oats and barley rather than refined carbs. You can also replace sugar in these recipes with jaggery or low-calorie alternative sweeteners. Keep a plate of dry fruits around for when you are in the mood for a snack. Replace crunchy chips with roasted almonds. Just like legumes, dry fruits are rich in proteins and fibre. Add a handful of almonds, raisins, cashews, pistachios, walnuts or even peanuts to your snacks. You can also use these to garnish your regular recipes and make them healthier. With these tips, you can enrich your everyday food to make it high in fibre. In addition to its effects on digestion, fibre is the secret to beautiful skin, hair and nails as well. It means that you will feel not only great by adding a little fibre to your diet but also look great from the outside. People on restricted diets often complain of deteriorating skin and hair, but proper fibre intake can eliminate those problems. Even for people without any dietary restrictions, fibre is an essential component of one’s diet, and should never be neglected. Live a healthy life by combining these fitness tips with our exclusive range of sugar free healthy juices! You can also try our collection of Fruit Vegetable Juices.